We Leave In Three Days!!! Then we go and get Jet! I’m still leaning toward the name Jet and I’ve been calling him that even though he’s not around us yet. I am so excited to get a small dog, a dog with an excellent start, and a Danish Swedish Farmdog! He is going to love all the things we’ll do together! 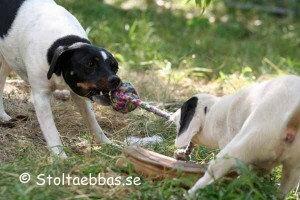 This picture is of him playing tug with another dog of the breeder’s pack. 🙂 I love that he’s playing tug and I hope he will like to play with me so I can use it as a reward for training. It’s so nice when you can use tug as a reward! So anyway, I don’t know if I’ll blog again before I go or not… but I’ll be posting to Facebook while I’m gone from my phone, so if you know me there you can follow me! So hopefully I won’t need any cheap life insurance for this trip…. and it’ll all go well and the flights will be safe and secure and it’ll be a quick jaunt from here to there and back again. I will be back by next Tuesday evening, the 14th, with my new pup! Tampa? You’re going to Tampa? And you couldn’t have done this next weekend, why? After all, by next weekend, I’ll be on our boat in Clearwater Springs, only 20 miles from the Tampa airport, and you could have seen our boat! Heck, on Saturday of next weekend, Barbara will join me there for a couple of weeks! Seriously, I know how excited you must be to get your new puppy! We want pictures, ya know! .-= SheltieJim´s last blog ..One Out, One In =-. My very first dog, back in England when I was young, was a Sheltie, called Rob. He was a nice dog, but very nervy. Anyway, I hope all goes well with your new pups, and that they stay healthy. I would advise you to keep them as chemical-free as possible, as chemicals will weaken their immume system and potentially cause inflammation and cancer. These chemicals are present in vaccinations, dewormers and most commercial dog food. I love the name Jet. I’ve had two dogs with the name Jet over the last 20 years. We just lost Jet (2) a border collie about 3 months ago, so I’m glad to hear you’ve found one with such a great personality!!! And I definitely agree that using tug as a reward is THE BEST! !…all the best. Yes, Jet and all our dogs is used to get their rewards after a good work by playing with us and a tug. It is a good way to reward and better contact, isn’t it? Previous Previous post: Obedience Is Fun!